The message on one of the many thousands of postcards sent from Clacton-on-Sea in 1931 was plain and simple: To Master Kenneth Dix, with love from Daddy. ‘Daddy’ was recovering from pneumonia and pleurisy, and was staying in the ‘Emily’ Convalescent Homes. Frederick Kirby had proposed the establishment of a denominational convalescent home in an editorial in ‘The Christian’s Pathway’ in 1909. Two years later he received an invitation to meet James Collin, a London business man and deacon of the Bermondsey Strict Baptist Church, to discuss this proposal. Kirby was overwhelmed with joy when Collin said, ‘I will tell you what I am prepared to do as a trial: if we rent a suitable house, I will furnish it and will finance it for the first two or three years, by which time I should hope it will be nearly self supporting’. 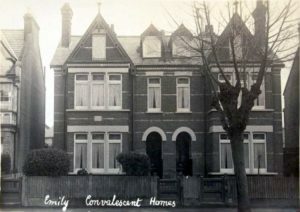 A committee was formed, composed of both men and women: a house in Colne Road, Clacton was found and furnished and a lady superintendent was appointed. The new Home was ready for the first visitors on the first Saturday in June. It was given the name Emily in memory of Collin’s wife who had died in May 1908. Initially only women and children were accommodated, for 9s and 6s a week respectively. 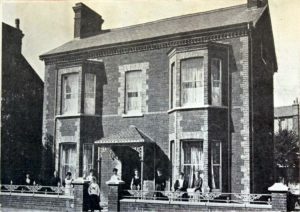 A Home for men (10s weekly) and boys (6s) was opened in 1914. These charges were increased by 3s a week in 1919 and then remained unchanged until 1939 when an all round increase of 1s was made. As the terms were always far less than those normally charged in seaside boarding houses there was a continuing need for subscriptions and donations. The Homes were open to convalescents (later the poor and needy) from all Strict and Particular Baptist churches. Ministers and their wives were also admitted, together with those categorised as Christian Workers. Only under exceptional circumstances were visitors allowed to remain for more than three weeks. As there was no Strict Baptist Church in Clacton, Sunday services were arranged in a nearby hail conducted by various ministers from the denomination. The number of visitors varied from year to year. In 1920 there were 302, but in 1927, described as a wet season, ‘when friends availed themselves of the commodious and comfortable shelters on the sea front’, the numbers fell to 172. In 1929 the Women’s Home in Colne Road (Hamilton House) was given up, Collin having purchased Nos. 68 and 70 Wellesley Road for the Homes. The ladies now occupied No. 68 (formerly the men’s home) and the men were moved to No. 70, a distinction which would remain on the Annual Reports until the late 1940s. Visitors to rise at 7.30am: Breakfast at 8.00am: Bible Reading and Prayer 8.30am: Dinner 1 .00pm: Tea 5.00pm: Reading and Prayer 9.30pm: Lights out 10.30pm. Punctuality at meals and attendance at worship are expected. The Visitors must keep their persons neat and their rooms clean and tidy. Shoes must be changed before going upstairs and a clean apron worn when making beds. Visitors were expected to assist in some of the lighter household tasks and were to ‘strictly obey’ the lady superintendent. These rules were implemented when the Homes were first opened and were still in force as late as 1940. At the commencement of the second world war Clacton was designated as a ‘Reception Area’, but with the threat of invasion in the summer of 1940 and a request from the Government that ‘persons should not visit places such as Clacton unless compelled’, the homes were closed, at least ‘for the present’. During the course of the war the premises suffered only minor structural damage, but considerable refurbishing was necessary before it was possible to reopen in March 1946. By the end of the year there had been 190 visitors, ‘comprising 67 women convalescents (26s a week), 12 men convalescents (28s), 15 Ministers (30s), 13 Ministers’ wives, 69 Christian Workers (40s), and 14 children (20s). Curiously, a little after this, the terms for school children of ten and over were higher than those for adults! The number of visitors in 1947 was only slightly larger and thereafter the numbers declined. There were difficulties finding suitable domestic staff during the summer season and there are indications that the whole ethos in the running of the homes had not moved forward with the times. It was also recognised that ‘since the advent of the National Health Act, the need for these homes has been diminishing’. Accordingly the trustees made a reluctant but courageous decision to close them down at the end of September 1954. Having served their day and generation the homes were closed: the property and investments were transferred to the Strict Baptist Mission and ‘would therefore continue to be used in another sphere of the Lord’s work’. James Collin died in 1952 at the age of 92. The Lord had prospered him ‘in both spiritual and material things’ and ‘he viewed his wealth as a sacred trust and responsibility’. Many organisations were the recipients of his generosity. His home in Breakspears Road, south London was bequeathed to the Strict Baptist Mission. Apart from him the Emily Homes would not have existed. To quote ‘The Christian’s Pathway’, ‘Many have had cause to thank God for the generosity which provided these homes for the denomination. Here the Lord’s poor have not only found rest and refreshment, but in the fellowship of those united with them in the bonds of living faith, have experienced kindling of heart and the cementing of new ties. Here, too, ministers worn out with their labours have found re-invigoration both of body and soul, and have been enabled to return with rekindled hope and sanctified memories of seasons of communion and fellowship with brethren in the Lord’.